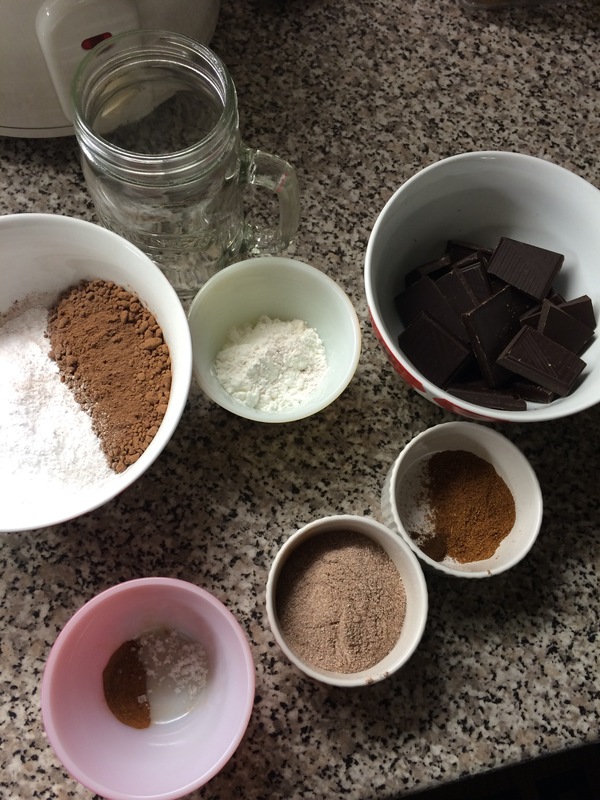 Uncategorized – The Baking Beauty Blog. Only 4 days left on the benefit advent calendar means every time I open it and the song sings to me, it’s taking less time for it to get to the corresponding number. 8 all the hors d’oeuvres was today’s line, and quite frankly this line sums up Christmas in my life. It’s just me all over. And I’m not even sorry. Today benefit gave me a fantastic little gift of a highlight stick called ‘Watts Up?’ And M&S gave me a tube of the Pure Super Grape Day cream. 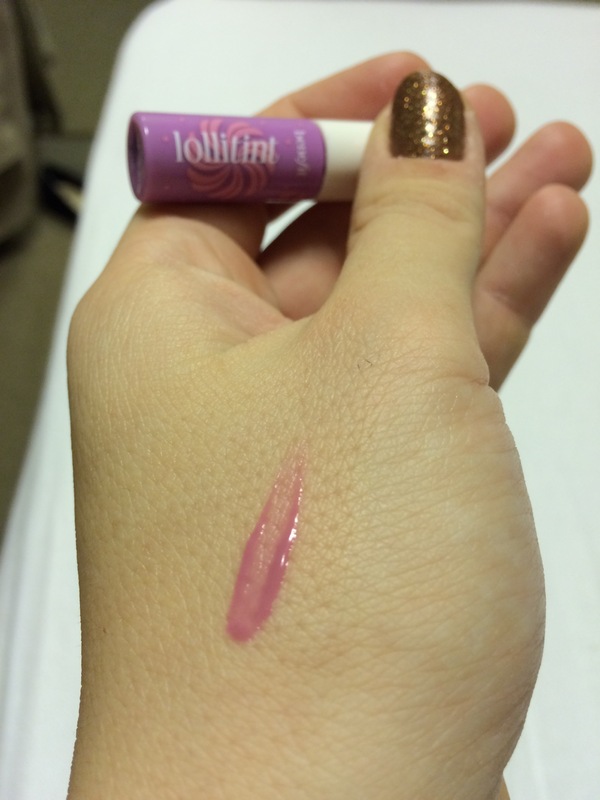 The highlighter is a first impression review however I have used the Super Grape before, and it’s brilliant. So watts up? No seriously Watts up? Sorry that was terrible but you must know by now I could pun my way out of a room with no doors, so passing up an opportunity like that would be just rude. 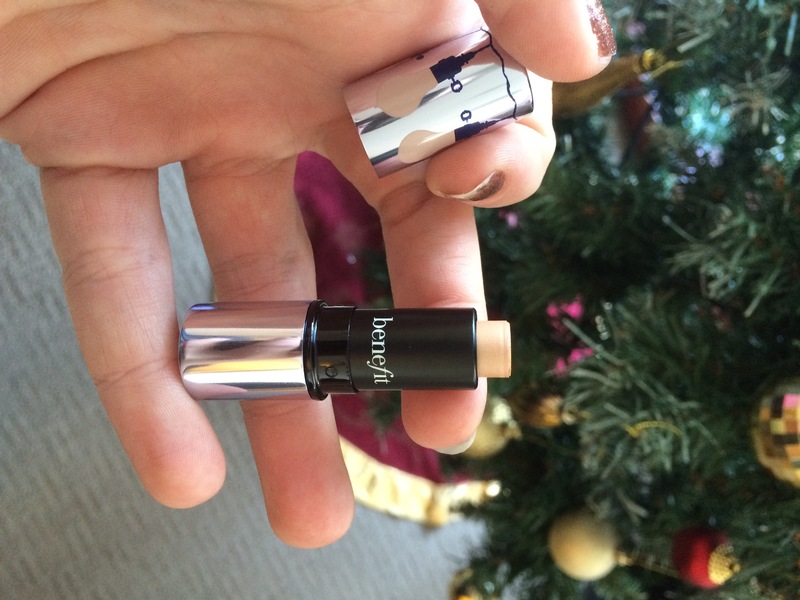 This highlighter has so much more to offer than the ‘High Beam’ that I previously received in this advent; since its in a cream stick much like that of a concealer, it’s much easier to manage and apply. The high beam being a liquid means it requires a lot more blending which, I won’t be technical with, I just can’t be bothered with. Who has time for double blending? No one. And it has to be set with a powder, and this one doesn’t. Again apply it to the general highlighting areas of the apex of your cheeks, Central forehead, central line of the nose, cupids bow and centre of the chin to allow the light reflecting particles to work their magic. Okay okay onto the super grape. As a home brand for M&S you can be assured that Pure will contain no parabens, they don’t test on animals and it’s products are formulated with the purest most natural ingredients. Which is a great start for any beauty geek because you want to be taking care of your skin with the most natural products you can get. 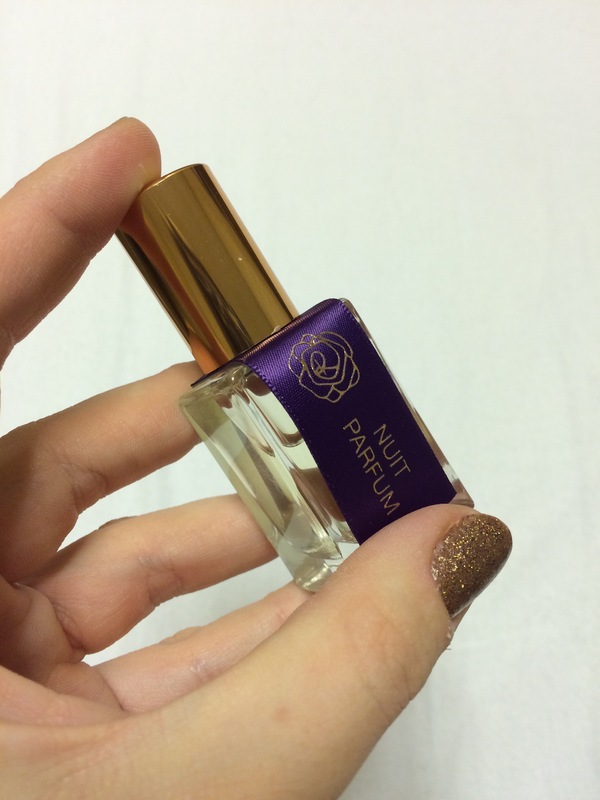 The super grape scent is refreshing and not too perfumed since the formula contains essential oils. I would recommend using this product daily because it’s affordable, absorbs deep into the layers of skin and with long term use will keep the elasticity in facial skin and ultimately, prevent wrinkles. Overall I’d say M&S won today since I already have a few great highlighters and this day cream actually has me excited to use it before I out my makeup on tomorrow. Is that a bit sad? Oh well I care not, I love my skin and want to take care of it, sorry if that makes me a sad case. I’m not really sorry. So the second week of December has arrived rather snappy which means only one thing; it’s time for the next Christmas recipe! So last weeks mince pie cupcakes got a huge amount of love which I’m incredibly pleased about, everyone seems to be loving the Christmassy flavours I’m baking with lately so the M&S Christmas cake curd makes a welcomed return in this weeks Christmassy Hot Chocolate Recipe. At this time of year not many people want to spend more time in the kitchen than absolutely necessary; in my house that’s understandable because if it’s not nan leaning over my just decorated cakes to make a pot of tea, it’s mum hovering around me for offcuts of cake. And it usually results in someone’s sleeve dipping in the buttercream. So with that in mind I’ve decided that this weeks recipe is a pretty quick process which will give you months of incredible Hot Chocolate. The best way to whazz up the ingredients for this recipe are using a food processor. So if you have one of those, get it set up now. If you don’t have one you can just chop or grate the chocolate and use a bowl and a wooden spoon. Start by refrigerating your dark chocolate so it doesn’t go all melty and gooey in the processor. After about half an hour take it out of the fridge and blitz it up for about a minute until it’s a fine dust. Then add in all of the other ingredients and pulse again about 3 times until well combined and it resembles a hot chocolate mix. 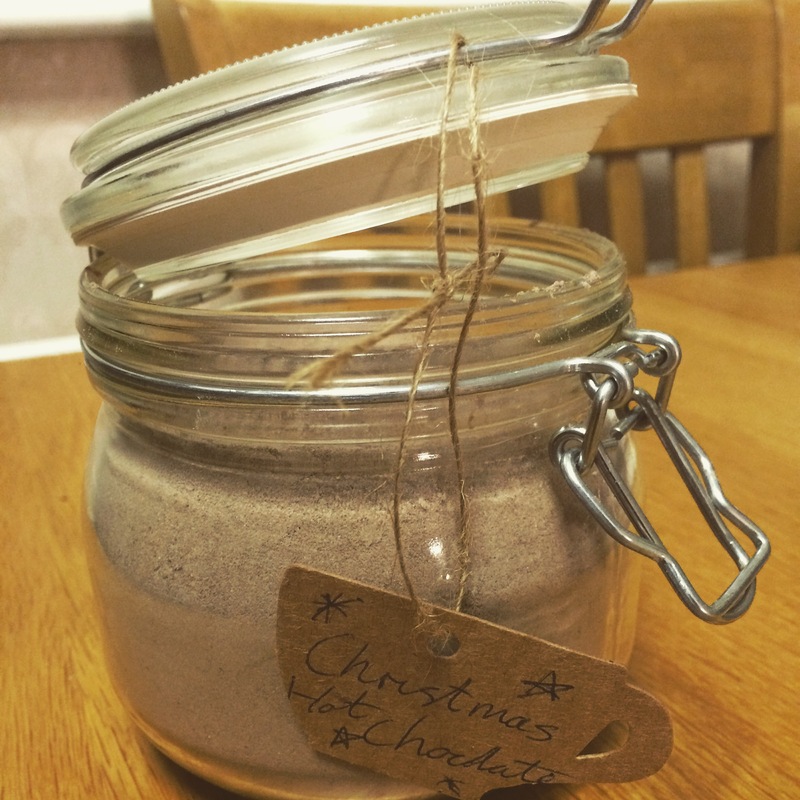 Feel free to leave out the mixed spice, cinnamon and cloves to just make an ultimate hot choc mix without the Festivness. But where’s the fun in that? Make sure you leave the sea salt in though, salt and chocolate go hand in hand. 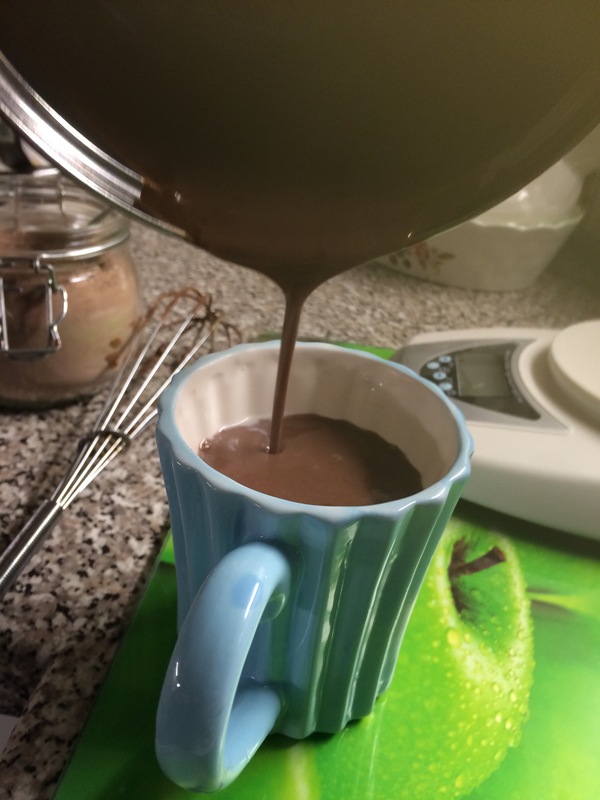 Now to make the actual drink; use enough whole milk to fill your favourite mug and 2 heaped dessert spoons of the mix. However if there’s more of you just double it or triple it depending on how many of you there are. Simmer it over a medium heat, DO NOT LET IT BOIL! That bit is very important in case you didn’t realise. Keep whisking it over the heat for about 5 minutes, when you can see its started to thicken. At the last minute add one of the tablespoons of Christmas cake curd, mix it in then take it off the heat and pour back into your favourite mug. 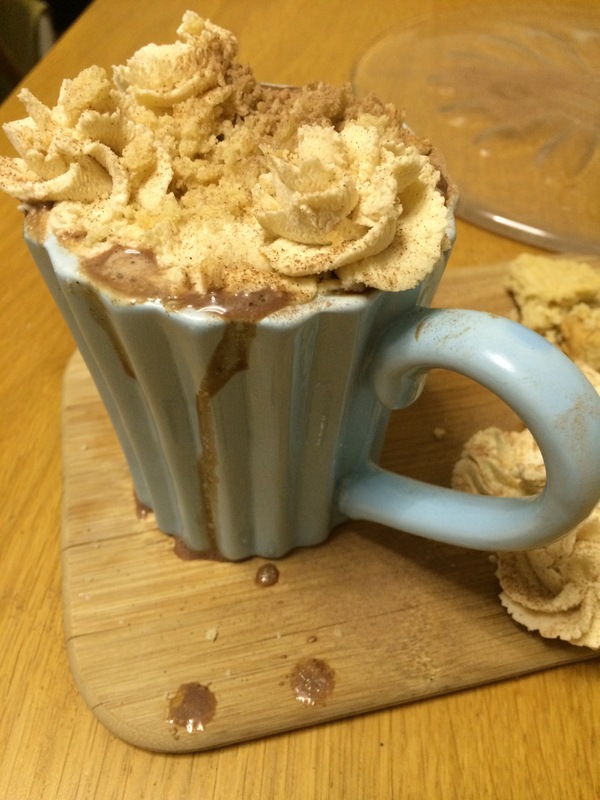 Give it a taste and if it’s just too rich for you then only use half of the hot chocolate and top your mug up with milk to let it down a bit. Now for a garnish that is not only pretty but useful too! 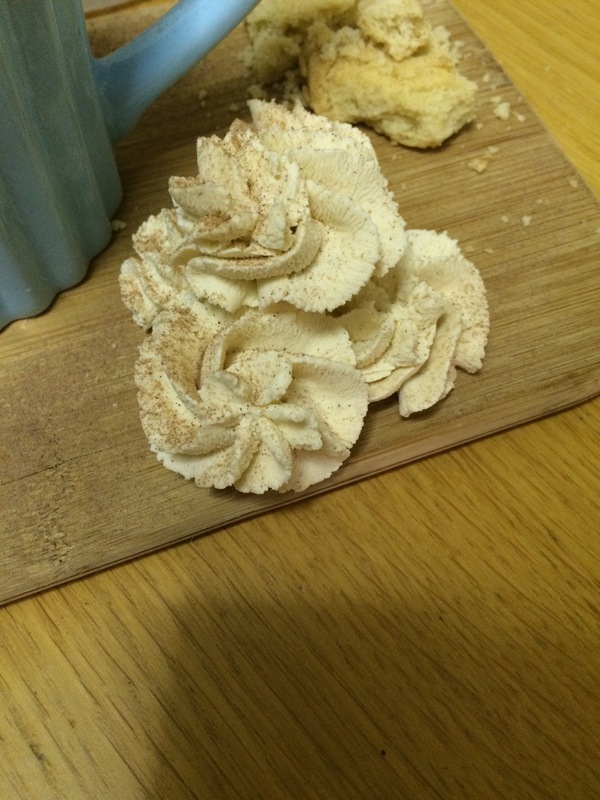 Whip up some double cream and chuck in a pinch of cinnamon with a teaspoon of caster sugar and the other tablespoon of Christmas cake curd, mix it up and pipe little rosettes onto a plate and put them in the freezer for a minimum of ten minutes. Once they’re chilled right down you can put them in your drink to act as a pimped up ice cube that also tastes fantastic. So garnish your socks off, cream, marshmallows, candy canes, gingerbread men… Whatever makes your heart sing. Once you’ve made this if you jar it up, put a nice little label in it you could give it as an epic food gift, or keep it all to yourself. Whatever you do you have to try it, it’s just Christmas in a mug, and the Christmas curd takes it to another level. Firstly I am very sorry this is a day late, but a girls got to work and yesterday was a ridiculous day. Anyway The countdown to the night that the man in red comes to visit us all is well underway and it all seems to be flying by super fast! Seriously, I could’ve sworn that yesterday was actually August. So on the 7th day of Christmas The beauty advent fairies gave to me; POREfessional balm(Benefit) and Rituals foaming shower gel. 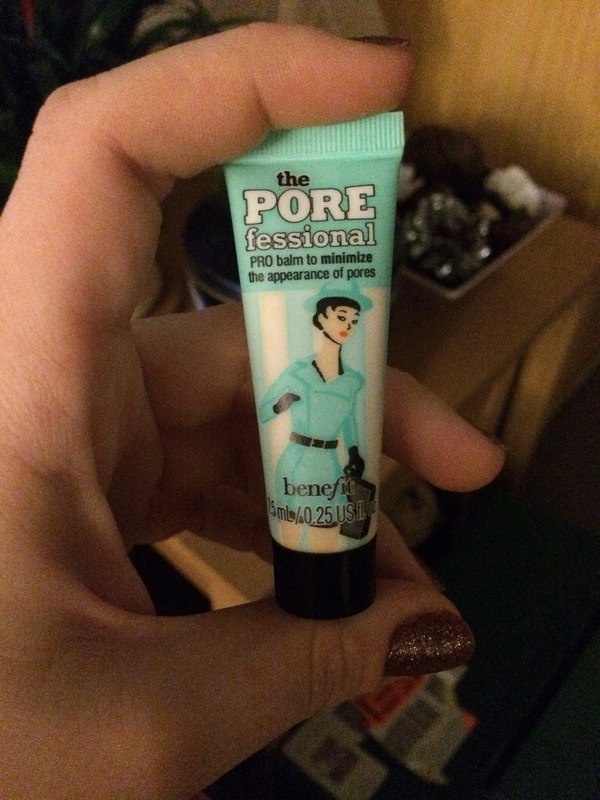 POREfessional is possibly the most highly anticipated for me since I have read so many glowing reviews and watched awesome vlogs about it. So excited is not the word. A little Yelp of joy genuinely came out of my face when I saw it staring back at me in all its’ colourful glory. Beautiful and dreamy as this little balm may be, it’s a tad confusing to the POREfessional virgin due to the fact that the sample you get in the calendar has absolutely no instructions on it. Nada. Not a one. And being called a ‘balm’ it could be product you apply and rinse off, a primer, a moisturiser or any other balm you can think up. So that’s a downside, but on a positive it’s the ONLY downside. This gorgeous, silky, pore smoothing balm is a beautifully luxurious skin primer that I find is best used before applying makeup, however it can be used after too. It fills fine lines and pores to give the illusion of a flawless, poreless complexion. I would moisturise before using it too if you have dry skin, if you have greasy skin then use the POREfessional under a tinted moisturiser then set with a light powder. Now next on the try me list for today is the Rituals foaming shower gel. When I was a kid there was nothing better than an aerosol of foaming shower gel, what a novelty! Christ that sounds sad but hey, I was a weird child. Now a Weird adult too but, I digress. Enriched with organic rice milk extracts with the beautiful subtle scent of cherry blossom this shower gel is sure to soothe away all your stresses of the day. Well that and a big old glass of vino. A bucket in my case. I used it last night and it leaves your skin feeling softer than silk and you AND your bathroom smelling so gorgeous, I really love it. Will definitely be buying this again. In conclusion, I don’t have a winner today. I know I know what a bore I am but they are both such fantastic products in their own way that I’ll be buying both again, so we’re all winners here! The excitment I expressed this morning was probably greater than necessary when I opened the Benefit advent calendar and from that little window was the product I have been waiting for since I bought it, winking back at me. Even though I’m already swimming through the 184 mascaras I already own, this one I was desperate to try. 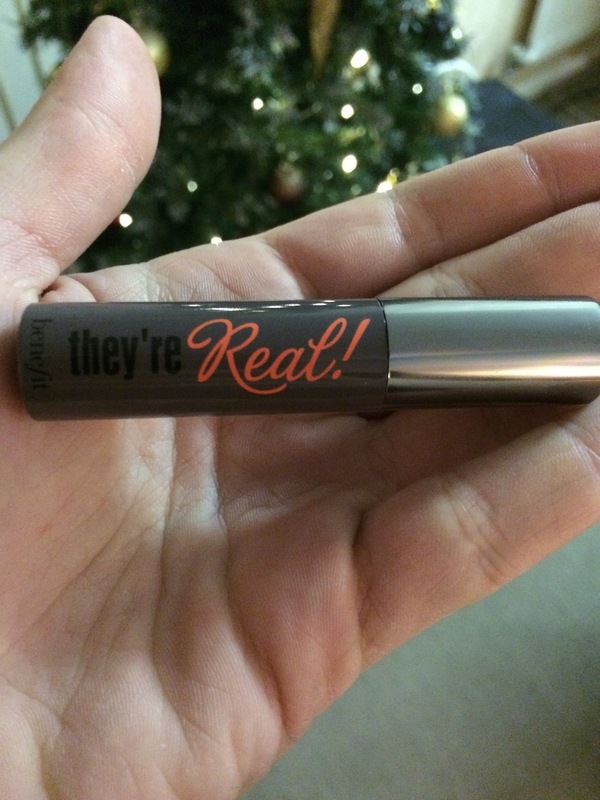 And from the title I’m sure the fellow beauty gurus out there will know it’s the ‘They’re Real!’ Mascara by Benefit. 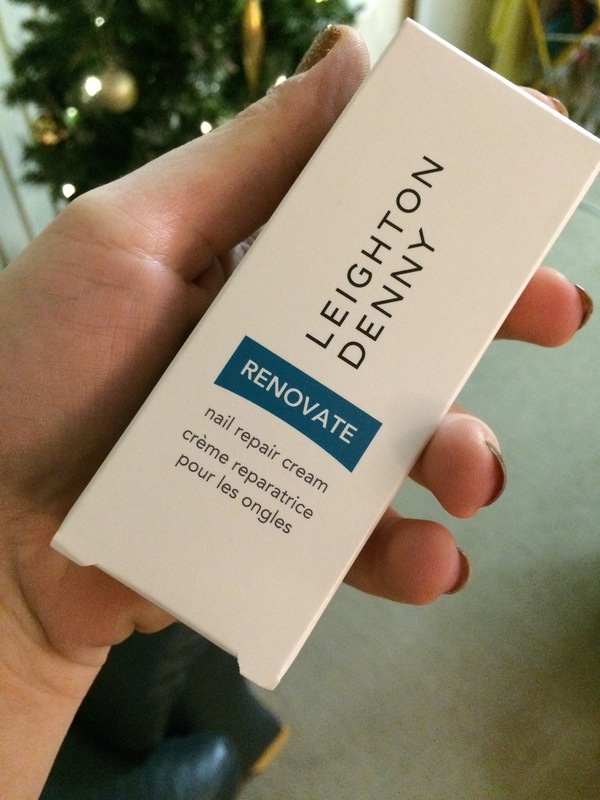 M&S were slightly overshadowed by Benefit today due to the fact they have given me the RENOVATE nail repair kit by Leighton Denny. An excellent product so I gather, don’t get me wrong, however up against a beautiful everyday makeup product like They’re Real! I was always going to vote Benefit. Therefore I’m already certain about which advent will win today. So since I woke up around 4 minutes before I was due to leave my house this morning, I decided to throw my war paint in my bag and make myself less of a monster once I was on the train. And let me tell you experimenting with a new mascara whilst on board a bumpy train, is a task done with great difficulty. Never the less, once I had gotten rid of all the black dots of stray mascara on my eyelid I was highly impressed with the result. Similar to Roller Lash (also by Benefit), this wand is a plastic bristle brush, which is the standard wand for achieving false lash effect by separating the lashes; in other words NO CLUMPING. so we’re already winning. But they’ve gone the extra step with this wand by adding more bristles to the tip, which give you a helping hand to reach those wispy lashes in the inner and outer corners of your eye; overall creating the illusion of brighter eyes and a darker, more defined lash line. Again, a mega win. So naturally I was fluttering my lashes at everyone today with the knowledge that they looked epic. Onto the magic of RENOVATE by Leighton Denny. I’ve previously said I’ve started to look after my nails after neglecting them for years, but that doesn’t stop them being brittle and causing my nail varnish to chip after just 5 minutes. No basic terms it’s a heavy duty buffing cream, you apply the cream and use the buffer that you get in the box to buff it into the nails to strengthen them and even out ridges. This product will take time to give a real review since it takes a few applications but going on the grounds that it sells really fast in the Beauty hall where I work, I’d say it’s worth the wait. Once I’ve used it I will post my full review. So yes you’ve guessed it, Benefit have won Day 5 with their fantastic They’re Real! Mascara. During December you’re no doubt going to have plenty of occasions that require fancier makeup than you’d normally wear, and this mascara just takes the extra chore out of applying false lashes. Which for me is a godsend because I simply cannot deal with false lashes.